Photos courtesy of Catherine Seo. 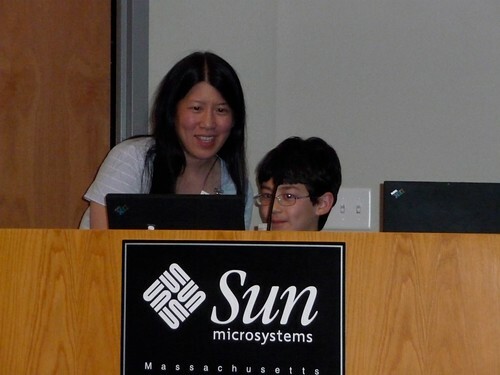 Several months ago, we attended a meeting of BostonCHI (computer human interface) where they discussed the MIT Scratch programming language and web community. 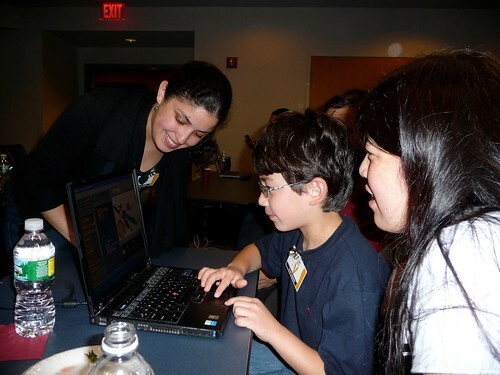 Evelyn Eastmond presented the philosophy behind the creating this programming language for young people ages 8 and up. You can create interactive stories, animation, games music and art and share them on the web. Since Adam is eight years old, I figured I would take my pocket nerd with me. There were a few kids there, but he was the youngest to attend. Adam had no interest in the presentation so he spent his whole time programming. I was also a bit distracted, texting with Quentin who had invited us and sat a few rows back. Since I had already tried Scratch, I was already somewhat familiar with it. But there were a few things that I learned during the presentation and quickly passed on to Adam. Then the group had some hands-on time where Evelyn checked in our progress. Evelyn Eastmond checks in on Adam's work. Afterwards, she invited all the kids that attended to show their work. There was an eleven and ten year old that went before us. They had a neat animation of their name and a spiraling animated character. Then Adam was up. He was hardly as tall as the podium. Please look at Adam, not his wild-haired mom. Since he had been programming for a good 45 minutes, his project completely wowed the audience. The toughest part was figuring out how to make the trampoline say “Ouch!” only when the car bounced on it. It would say ouch after the first hit and then stay that way as the car bounced on the trampoline. But we figured it out together. He definitely had the most complicated project there, probably even for the adults. It was awesome! You can check out his bouncing car project online at scratch.mit.edu as well. Press the green flag and then the space bar to start the animation. I am so glad that he got my programming gene. I'm one step closer at getting him into MIT.